What the hell does Che Guevara, the infamous Cuban revolutionary, have to do with Buddhism? I'm guess it's probably never been on the radar for most of you, and I'm also imagining that the very mention of the name sparks powerful reactions for some of you. Freedom fighter. Compassionate doctor. Communist troublemaker. Armed terrorist. Maybe one or more of these phrase fit how you place him. 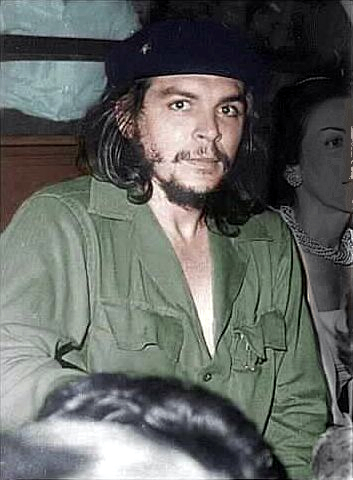 Certainly, the man has been romanticized on the one hand by people on the left who sport t-shirts with his image, and/or have seen movies like "The Motorcycle Diaries" or who have read his writings about the impact of colonialism, capitalism, and the dream of a unified American continent (north and south). Whatever the chosen image, he almost always seems to be larger than life. Arguelles goes on to say she really didn't know why she had asked him that, of all things, and how her friends wondered, in amazement, why she spoke of the Buddha of all things to this powerful political figure. And then she writes that a few weeks later, her father, who worked closely with Guevara at the time, arrived home one day with a package. It was another book of poetry, with a letter in it that said "Che said to tell you he looked very hard for what you wanted but couldn't find it. He sends you another book of Neruda poems for your collection." What's totally interesting to me is that her father knew nothing of the earlier exchange; he simply brought the message and book home to his daughter. Now, maybe this is just a nice story, you might say. In fact, some of you might think it's propaganda to support a more positive image of the man. Whatever you think of Guevara, it's worth noting that this story is a great example of how people - especially well known people - are usually much more than we see. The human mind tends to compartmentalize well-known people, or even people we know, by ignoring the whole picture, or assuming there's nothing beyond what we know. This iconic figure who sought an end to capitalism and injustice globally, and who also relied heavily on violence measures to do so, was also just another person in the world. This simple act of kindness on Che's part, never mentioned in the biographies and love-ographies or hate-ograpies, brings him back down to earth. It's also the case that we could probably easily find stories about the guy making mundane mistakes, which again would temper the dramatic, larger than life character he has become. It seems to me that it is our job, as Buddhist practitioners, to drop off all pre-conceived stories about both those in our lives, and about those who lived in the past, and to be ready and open to be surprised. This story of Arguelles provided a moment of surprise, an opportunity to shake the story I had about Guevara as solely a sometimes inspirational, sometimes destructive revolutionary. Maybe he had no interest whatsoever in the Buddha and his teachings; that's irrelevant. What is relevant is that he took the time for this young woman, even if that effort was at least partly motivated by ties to her father or to desires that she would support his politics. She wasn't anyone important, so even if his motives were tainted in the ways I just suggested, it really didn't benefit him much. So I see this as an act of caring. Someone asked him about a writer he loved, and he tried to find something else out about that writer for the other. As a writer who loves many other writers, both living and dead, I completely get this act. I've done it myself, without any belief that I would gain by locating information about writer X.